Posted on February 25, 2016 February 24, 2016 . by Patrick Johnstone. As it is budget time again at New Westminster Council, people will soon be asked to provide some feedback to our somewhat byzantine financial planning. This is an area where the City’s public engagement process could definitely be improved, but it may be the most challenging part of community engagement, because there are a variety of barriers between making municipal financing understandable to most people, while still providing a complete enough picture of how our budgeting works and where our your money actually goes. The City’s books are, by regulation and practice, completely open, but that doesn’t mean the data presented is put into a context that is useful for most people. This is augmented with a general lack of understanding of how municipal financing works, including the Public Service Accounting Standards, auditing, and formal reporting that is done by every City in the Province. 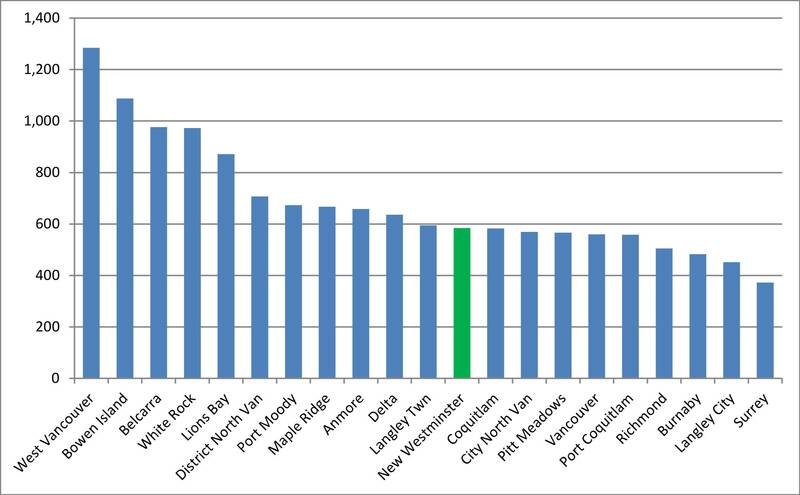 So to start the conversation here about the 2016 budget plan, I want to put to rest, once again, one of the myths we commonly here in New Westminster: that we are “The Highest Taxed City” in the Lower Mainland. To challenge that idea, I am once again going to the standardized financial reporting data that every City provides to the Province. I have already talked about Mil Rates, and not much has changed since I wrote that blog post all them years ago – Mil rates are still a terrible way to compare taxes between Cities. Actually, pretty much any way to try to compare taxes between Cities is a terrible way. Every comparison includes some confounding variables hidden in the data, because (back to the top) municipal budgeting and taxes are a complicated topic. 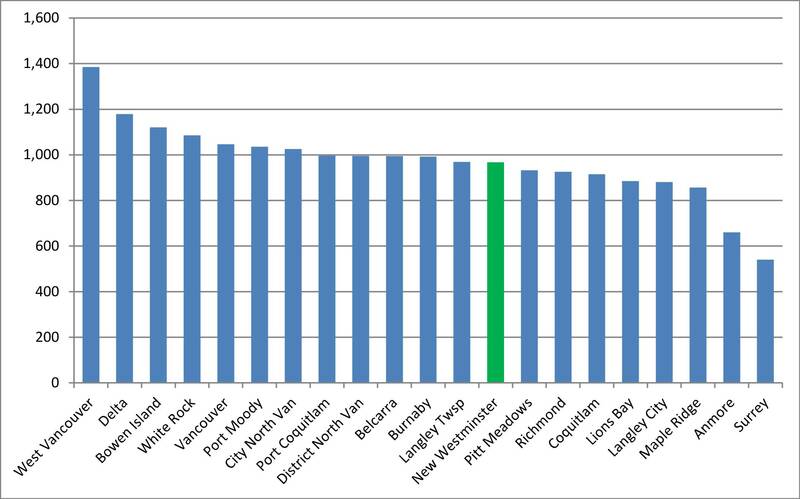 So for the purposes of this post, I will provide a couple of charts showing that we are not, as some would assert, the highest-taxed City in the Lower Mainland. Again, all data from the BC Government sources cited above, which is about the most impartial source of data available for local government finances. Residential property taxes collected in 2015 per capita. Table 1 shows the amount of residential property tax paid to the Municipality per person who lives in the Municipality. This does not include taxes paid by industry or businesses, or other fees the City collects, but right off the top, you can see that New Westminster is no-where near the most taxed Municipality. But this is only Residential Property taxes, and Cities vary somewhat in the amount of industrial and commercial taxes they collect relative to residential taxes. As a bit of an aside, Table 2 shows how much of the taxation burden is carried by residential homeowners, relative to how much of the present assessed land value is residential. In every City (except those few lacking commercial or industrial taxpayers), the business community subsidizes the homeowners. 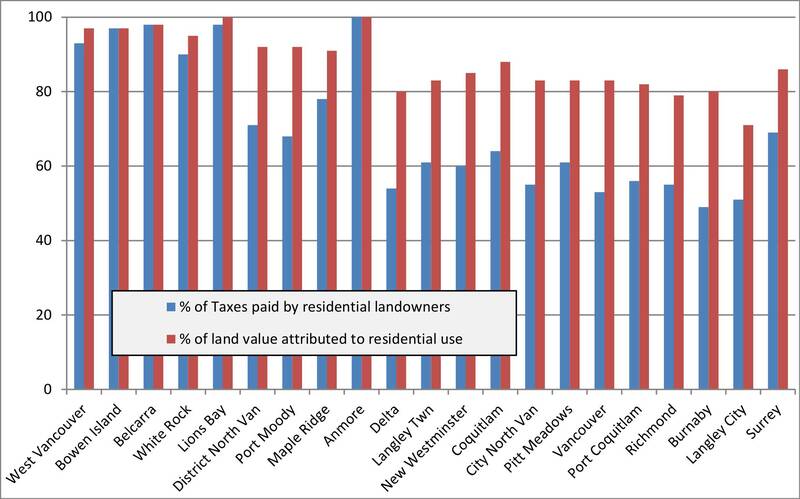 The few Munis with almost all of their revenue collected from residential land are the anomalies, but the “gap” between tax burden and assessed land value here in New Westminster (~25%) is not out of line with that of our “competition” with similar tax rates. All municipal taxes collected in 2015 per capita. If we widen our focus away from only taxes collected from residential property owners, and put all municipal taxes (residential, commercial, industrial, etc.) into the bin, we end up with Table 3, the amount of municipal taxes collected from all sources per capita. Again, New Westminster is somewhere in the middle, skewing slightly (but probably not significantly) towards the lower-tax side of the spectrum. The Cities that moved up are (naturally) those with the largest commercial and industrial land bases. Vancouver moved up 11 places from one of the lowest-tax cities to 5th from the top, Delta from the middle of the pack to the second highest (thanks to their low population and the Annacis Island cash cow), while residential bedroom communities like Anmore, Lions Bay and (sorry) Maple Ridge move way down to where they look more like comparatively lower-tax communities. However, there is one more way these comparisons of taxes are not fair between jurisdictions, and that is in the other ways some municipalities choose to collect money from residents and businesses. Fees, Local Area Service Taxes, and Parcel Taxes are ways that tax burden can be kept off the “Mil rate”, but still appear on your bill. These are, fortunately, reported to the Province, which allows a more fair comparison between the Cities (Surrey, Burnaby, Coquitlam) that collect millions in Parcel Taxes with others (Vancouver, Richmond, New Westminster) that collect none. Table 4 shows what happens if these additional taxes are included with your variable property taxes, and the Cities are compared, again on a per-capita basis. 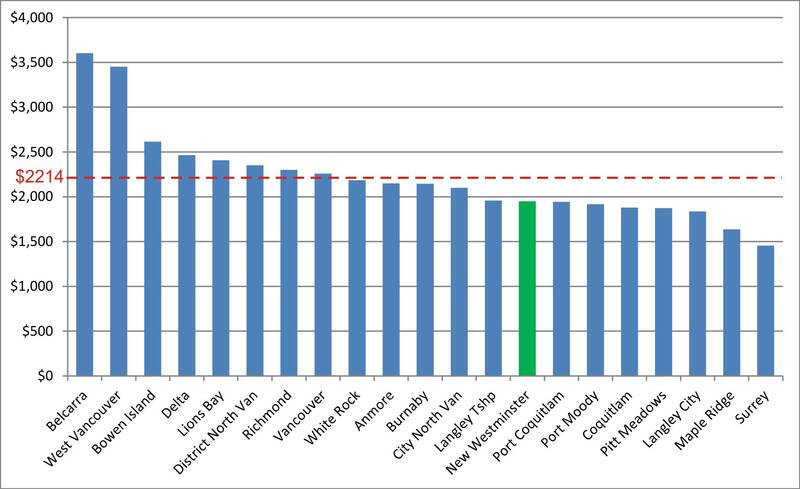 Not only does New Westminster compare well against out neighbours, we are significantly below the average per-capita taxes for the region, shown by the dashed red line. For the fun of it, I calculated what it would mean for New Westminster to raise its taxes to match the per-capita regional rate. To get there, we would have to collect $18.5 Million more every year, or $264 per resident. To put that in perspective, an extra $18.5 Million per year would pay outright for a new Canada Games Pool in 3 or 4 years, a new Animal Care Facility in less than 6 months, or enough money to raise our annual grant fund for festivals and other services by 20 times. That is a crazy amount of money, and that is the amount we are below the average for the region. Do all cities charge too much taxes? Some would argue that, while other question whether cutting municipal costs to the bone is really worth the erosion of livability that usually results. And threading that needle, my friends, is where we need to have a better discussion around the City’s budget. Community – Coldest night and more! More taxes – with colour!